There are so many things wrong with this photograph that I don’t know where to start. It sums up perfectly how Americans continue to commemorate and think about their civil war. This photograph was taken some time during the 2017 Gettysburg reenactment. I am curious to know what you see wrong with the image. There is nothing wrong with the photo. Kevin has no clue what any of the people in the photo are thinking, have thought, or will think. At no point did I claim to know what anyone in this photograph is thinking. It’s definitely implied, otherwise you would have never posted this. Go on… tell us what’s wrong with this photo. You are free to believe what you will. Thanks for taking the time to share your thoughts. for one thing, soldiers ditched their knapsacks before forming line of battle. there should be no parades with costumed participants? Do we know there was no engagement before and after the event? perhaps the reenactment participants should stop every 5 minutes or so and discuss ’causes and meaning and results’? It seems to me rather akin to all those people who took their picnic and champagne to First Manassas, only probably less dangerous. It, for me, is the juxtaposition of something as serious as war and the deaths that go with it, with something as crass as beer and shorts. I remember seeing a similar scene at Cedar Creek in an old video about re-enactors, and thinking how odd it was then. I had two relatives die at Gettysburg, one on each side, and I generally don’t attend these kind of events out of respect for those two men, among all the others. Not quite. The audience at First Bull Run understood that the weapons were loaded. I would look at this photograph in two ways… One, it’s good to see individuals striving to keep the memories of their ancestors alive (on both sides). Second, I would like to think that events like these would potentially spark an interest in the war beyond a re-enactment. In other words I would like to think that in addition to attending this event these onlookers would also visit the monuments and museums that surround them in order to gain a better understanding of the war and the way it is commemorated. This could initiate an interest leading to a much larger understanding. Aside from the obvious “spectators in tailgating chairs enjoying the mock battle” absurdity in the photo, I’m not sure I see anything else that’s an enormous issue there. Is it an issue with the reenactment itself? There shouldn’t be reenactments, etc.? Your statement seems to imply that the way people commemorate the war is wrongheaded. I’m curious as to what way that would be. I could not agree more. There are many great living historians, but I have soured on re-enactments. It makes war seem like cheap theater. Not to be too cynical about this subject as I know reenactments have a broad meaning for many of those who participate (and I did for 35 years). The interest for re-enactors is primarily (and sometimes arguably) to honor their ancestors who served during the war or, if no ancestors, heighten their personal interest in the War, or hang out with some of the best friends anyone could ever have. It is also a substantial financial investment, and combined with travel expenses, etc., not a cheap hobby by any means. Civil War reenactments dramatically evolved in size and scope during the 1980’s up to today, and it has become a business industry; companies, committees, etc., host large scale events, charging participants for insurance and other amenities including basics like wood and water, and the public an entry fee to see the Civil War up close and personal. These events would not be held if they were not profitable and today it’s entertainment rather than a recreation of an actual battle, a show for paying customers who get to witness the spectacle of hundreds (sometimes thousands) of blue and gray clad hobbyists clashing in a broad and often picturesque landscape. And it’s not that easy on the participants since they are usually scheduled for several pitched battle scenarios held morning, afternoon and early evening as well as parades and other displays for the paying public. Organizers can call these scenarios the battle of the Peach Orchard at Gettysburg or the fight at the Sunken Lane at Antietam but the end results are far and away from what happened tactically with the end result of hundreds of maimed and killed. All the casualties arise at the end of these scenarios and a moment of silence is observed as Taps is played, and it can be a very chilling moment in the right setting. So as critical as we may be about these events and photos such as this, they do spark an interest in some who attend to learn further about the Civil War and this turbulent period in our history. By no means do these events strike any high level of education about the war, but they can be a humble beginning once we look past the ticket sales, funnel cakes, inaccuracies, live-fire demonstrations and faulty legends repeated countless times to passing families. 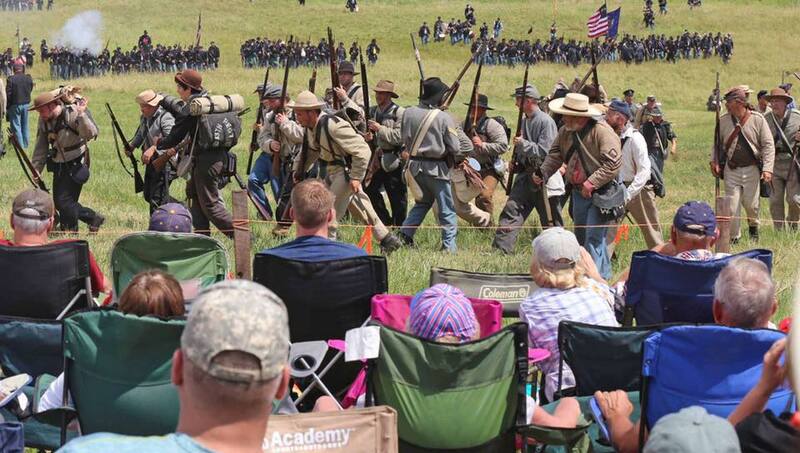 If we’re looking for a greater meaning in events like the annual battle of Gettysburg reenactment, it’s simply not there and I doubt it can ever be. The causes of the “War Between the States”, the social disruption and hardships, political aspects, atrocities, the struggle for freedom and end of slavery, and war’s turbulent aftermath simply do not fit into the script of hosting such a spectacle and never will. I would argue that reenactments do have a value apart from being money making gatherings (and typically a portion of the profits go toward battlefield preservation), though I’ve also experienced first hand how misleading and downright silly they can be when we have higher ideals of their potential not only as entertainment but for educational purposes. Unfortunately, the latter does not sell as well as countless waving battle flags and booming cannon. This is just picking the low-hanging fruit. One Confederate’s knapsack is stamped “13th Regiment” which doesn’t seem right. I’m not an expert on ACW era clothing, but several of the Confederates’ headgear seems a little questionable. Hard to tell for sure but a couple of them also look like they might be wearing blue jeans. Several of the muskets have rifle slings, which I don’t think existed at the time. At least one Confederate is carrying is rifle backwards on his shoulder. There seems to be a remarkable lack of smoke on the battlefield. The maneuver being undertaken by the Confederates seems remarkably casual and would probably induce heart problems in any drill sergeant witnessing. It also doesn’t seem like the kind of maneuver that would take place in the open at such close range to the enemy – go forward, go backwards, but don’t just jog past them. The regiment’s color guard is missing, although it might simply be out of frame. The red-hatted gentleman on the left is an artilleryman if I’m not mistaken. If so, that seems like an absurdly exposed location for artillery and makes the Confederates dash seem all the more out of place to me. I would think the proper maneuver in this case to support the artillery would be to move forward up to the artillery’s right flank and let off a few volleys to allow the artillery to limber up, then fall back. I have poor depth perception so I’m not good at guessing range, but the Confederates might even already be at reasonable range to stand and fire in support of the artillery even without moving up into a supporting position on their flank. However, I would presume the artillery would want a meat shield on that flank. I was in a Union reenacting organization for about 10 years, but confined my activities to living history events; I only engaged in a couple of battle reenactments. I found them to be poor vehicles for educating the public. There was never any sort of interpretation provided for the public of which I was aware. I also felt queasy about the whole idea of pretending to portray something that was inherently brutish, gruesome, terrifying, and tragic. Having it done done for an audience that applauded at the end like it was a sporting event did not help. Going to graduate school and researching reenacting for my thesis only re enforced my position. Some reenactors do genuinely care about educating the public, but for others, it is not their top priority (or a priority at all). Either way, what they mean by educating the public does not always correspond to what a historian would mean. It is helpful to think of reenacting as a site (or sites) of memory that seek to keep alive memory traditions by trying to make the war “present” for themselves. Thanks so much for taking the time to respond. I’ve always believed that living historian can play an important role in educating the general public. I’ve never found reenactments very interesting, but then again I’ve been on battlefields and seen people who wouldn’t have found the markers, museums, and displays interesting who were drawn to reenactors. There are all different levels of engagement people have with history and what has value to one person may not have any appeal to another. I don’t think it is a binary choice where this sort of engagement is preventing anyone from learning about the social history of the war. I generally agree with you regarding re-enacting. It is not typically something that I find to be particularly interesting or productive, but I would offer the point that things like replicating maneuvers, demonstrating tactical theory, weapons demonstrations e.t.c., do have value and can offer insights to the historian and to the student. There was a demonstration of the Spencer repeating rifle at Franklin several years ago (around 2011 or so) which I saw online that I found to be helpful, for instance. I picked up on a few things in a only a several minute long video that I hadn’t necessarily thought about before that. So, it is a mixed bag I think. What I object to about these large scale combat re-enactments like the one photographed are that they are really about entertainment at the expense of education. To me, that is unfortunate because while I recognize that everyone understands events at their own levels, I would prefer it if people attempted to challenge themselves intellectually, no matter what level they may capable of doing that at, rather than just looking to re-enactments for cheap excitement. Previous post: Can Historians Disentangle Reality From Myth on Twitter?